I recently adjusted my system in a slight but significant way. 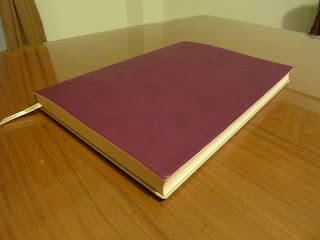 I'm happy to report I'm still enjoying using my self-made planner in my purple Daycraft Signature notebook (click here to read my post about the details). I love this notebook. The purple cover is gorgeous and soft to touch and the paper is thick and smooth. Using this notebook is an excellent aesthetic experience. In fact the next time I'm at the bookstore I'm going to buy another one of these to have on hand as a journal or for some other noble purpose. After a few weeks of use I changed the weekly format to match that of the Moleskine Weekly Notebook, because I prefer linearity of my days throughout the week. But, predictably, the day spaces were too small for me. I have learned through precise mathematical study that I need day spaces of at least 60 sq cm, and the day spaces in my self-made planner are only 46 sq cm. 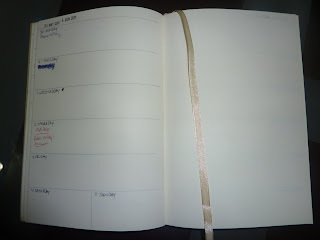 I still use my weekly planner to plan future events, so I can see what's coming up. I use the blank page each week to write my lists of what needs to be done that week. Every evening I fill in tomorrow's page in my Mole with my schedule for that day and specific tasks (especially ones that need to be done at a particular time of day). This is helping me immensely, because I can map out my day and get a good grasp of what to do and when. I don't write future things into my daily Mole, just the current day. I use my weekly lists page as my Master List and today's page in my Moleskine as Today's To Do's, kind of like Bill Westerman's Getting Sh-t Done system. At the end of each day, I have a record in my Mole of exactly what I did that day, like a more-detailed version of Austin Kleon's logbook. At 126 sq cm per daily page, my pocket size daily Moleskine has plenty of room to write everything I need to do on any given day. In fact, if there are more things to do than will fit into that day's space, I don't have time to get it all done in one day. (If I were using the pages for journal entries though, I'd need the Large daily). 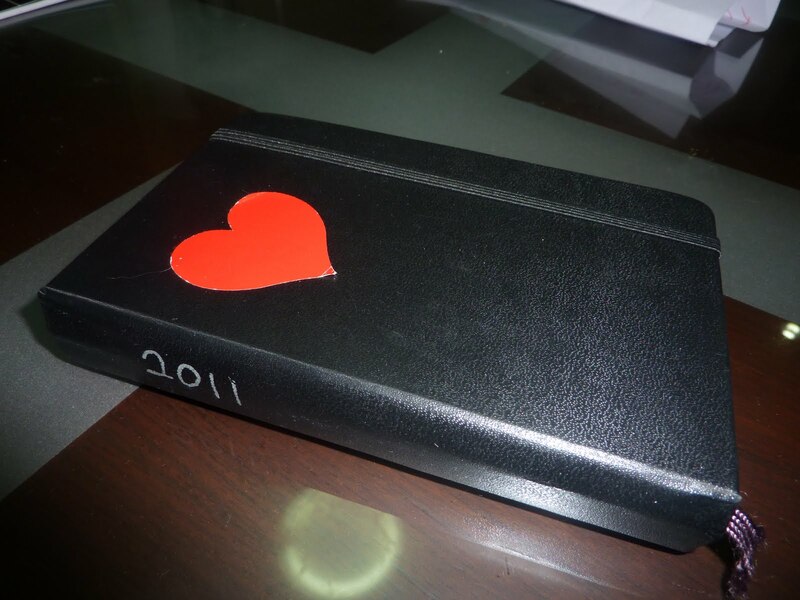 Just for fun, here are a couple of photos of the cover of my daily pocket Moleskine with a heart sticker my kids gave me, and the year in silver Sharpie on the spine. Click here to see the page edges of my Mole, where I drew monthly tabs. I really like the size of the pocket daily Mole, the way it fits in my hand, and the look of the pages. I'm enjoying using these two planners, because I really like them both and this way they each have a purpose. And because the weekly is only for future planning and the daily is for arranging and recording only today, their purposes don't overlap so it's not confusing. Also they are each so small they both fit easily in my bag. 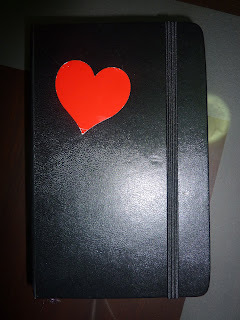 But to be honest, I expect this system just to get me through until my 2011-2012 Extra Large Moleskine Weekly Notebook starts at the end of next month. I have very high expectations for it! laurie, i would really like to see a picture of all of the planners you have use so far in a giant pile. seriously, maybe for june 1st? LOL that is a great idea! Although a photo like that could very well make me look even more bonkers than I already sound! Laurie, I ordered my first filo 2 weeks ago. I got the personal Siena in expresso. 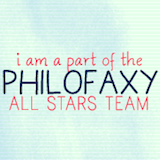 I am using this one for everyday stuff. Then two days ago I order the personal Domino in lavendar. I am going to use this one for craft/workshop organization, including gifts I need to make. Now I really want one to use as a journal. I think the A5 would be the best size for a journal. But I want the Deco sooooooo bad!!!! So now the dilema...what should I use the Deco for and which filofax would make a great journal? Yes I have a obsessive personality and when I fall in love with a product, I really go crazy. HELP???? Kelliejo, although I agree the large page size of the A5 would make it a good journal, if you are going to get the Deco I would suggest you use it as your journal. Having such a beautiful binder as your journal would make your journaling experience that much more enjoyable! But, if you are committed to using an A5, I would recommend whatever you like best, to encourage you to use it every day. If you are tactile, get the softest leather. If you are visual, get your favorite color.